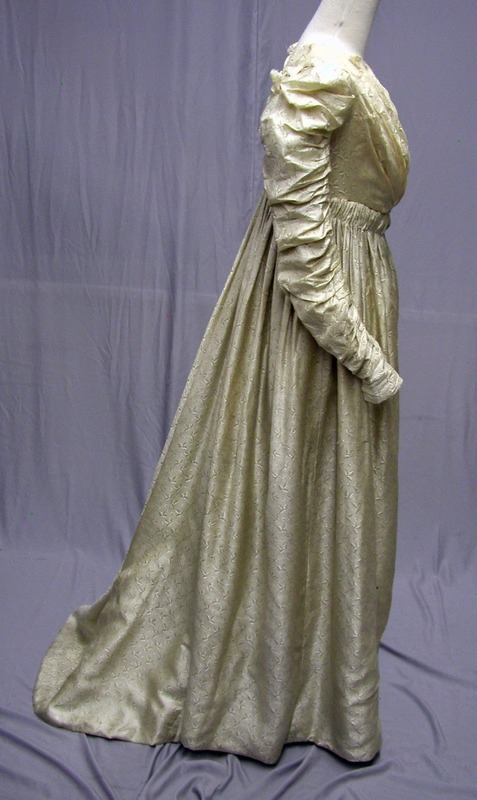 #1065, 1810's Silk Figured Ballgown - American Family: This gown I purchased from the fifth generation owner. There was no one else to pass it down to at that time. It is a very tiny size. It is in fragile condition. The skirt has some worn places and some splits. 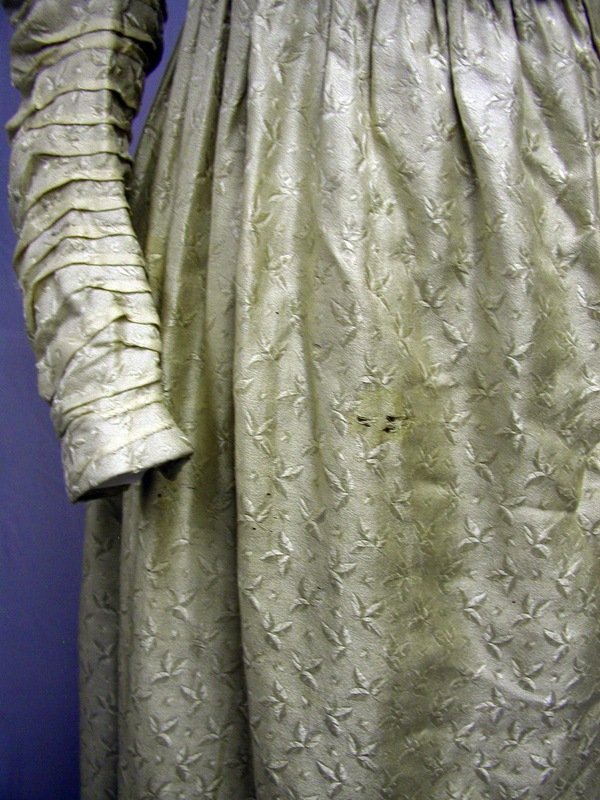 The top of the bodice and the top of the sleeves are heavily damaged with numerous repairs. The bust is 30, and the waist is 22. I could not close the front on this dress form. When I have exhibited it I have used a period lace shawl to drape the bodice. In the lining it has its original mother of pearl buttons and original eyes. The hooks were replaced in 1876. I bought this gown over 20 years ago in a little town on the other side of Denver Colorado. I followed a lead that a local dealer gave me when I asked for antique clothing. When I was young I wasn't careful with keeping all the info. I had written or been given. At that time provenance was not so important to me. I no longer remember the name of the family. This is the story that I was told by the great great granddaughter who was in her 70's or 80's in the early 1990's. 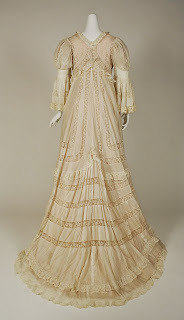 This dress was worn at a ball here in America in the early 1800's. It was handmade from ivory figured silk. It was passed down through the generations. 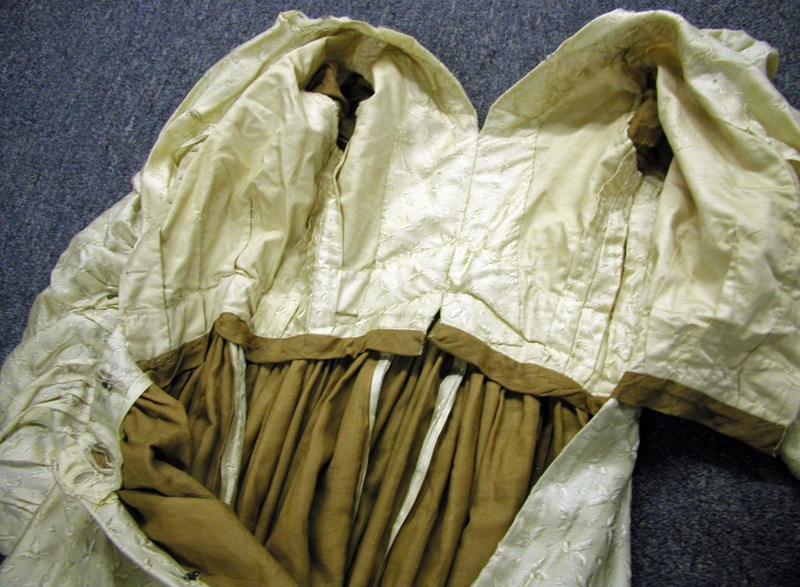 In 1876 the gown was taken out of its trunk and the skirt was relined with brown polished cotton at that time, and the bodice was reinforced. The granddaughter of the original owner wore the dress on the Fourth of July for America's Centennial celebration. The brown polished cotton (See photos) was sewn in and the entire skirt was taken apart and lined with it, and sewn back together with machine sewing. This makes a huge difference to many collectors and some museums because the dress has been compromised. The design wasn't changed at all, but the lining was. It goes without saying that it is still a lovely dress. It probably lasted a little longer because of this lining. The lining in the skirt is good, but they relined the sleeves as well and that lining is beginning to shatter. All of the tucks on the sleeves and the bodice are all hand sewn. It is an amazing part of American History. There is just too much that screams late 1890's to me. Yes, sleeves in the 1820's got ridiculous as well - however, the sleeves of the 1820's go out whereas the sleeves of the 1890's go up. 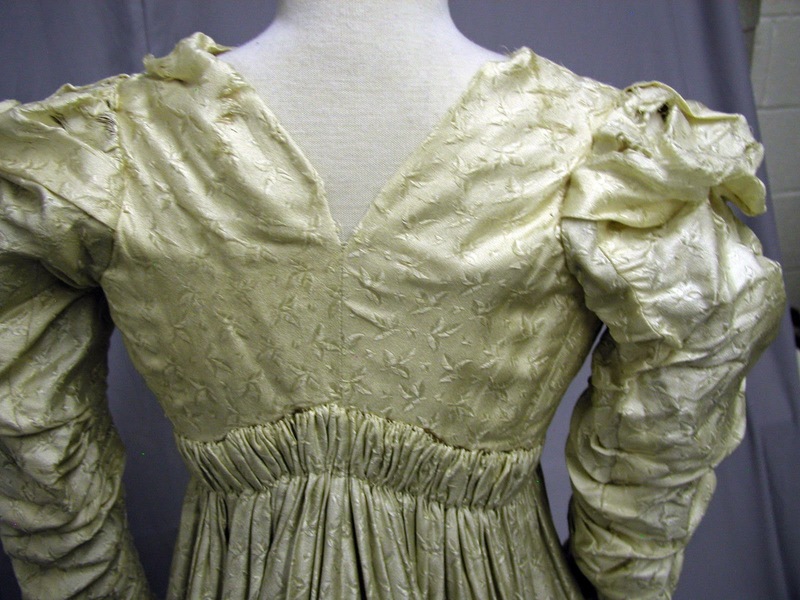 The difference is in the patterning - the sleeves of the 1820's have pretty normal "curves" when it comes to the difference between the underarm and the top of the shoulder. 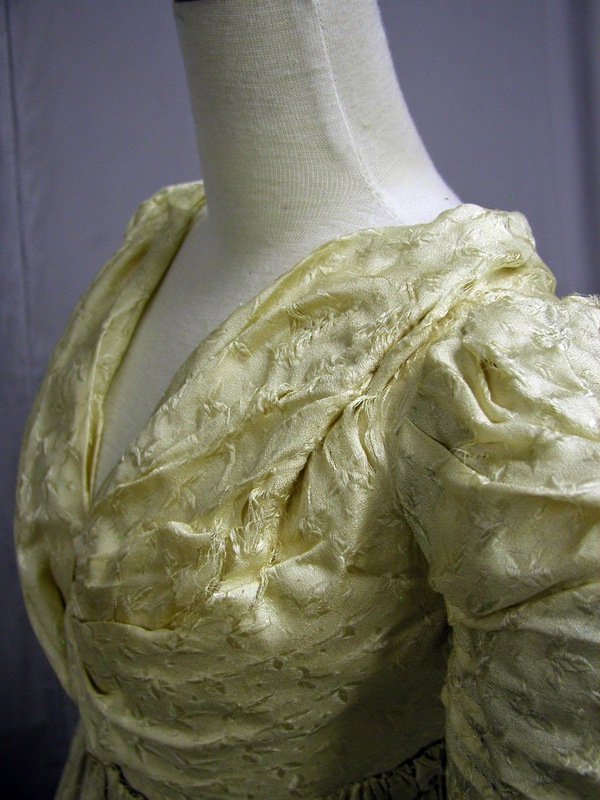 It's the width of the sleeve that gives the "puffiness" in the 1820's. In the 1890's, the curve (Armscye) is highly exaggerated. 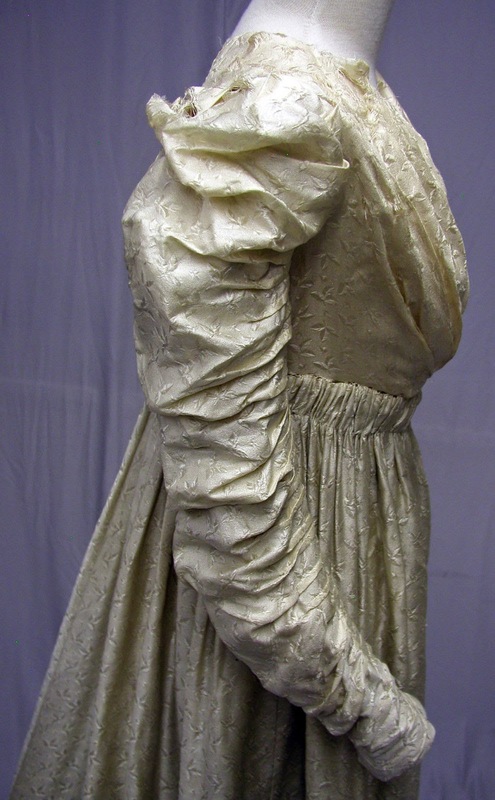 Sometimes, there is additional width given to the sleeve as well but the excessive difference between the underarm and the top of the shoulder is what gives the puffiness of the 1890's. This is what causes the 1820's (and early 1830's) to go "out" while the 1890's go "up". These sleeves want to go up. A somewhat faux inverted V back from 1900 They used ribbon to fake the inverted V look. One of my favorite Liberty Dresses from the 1890's also have the inverted V back. The insides as well point to a much later date. 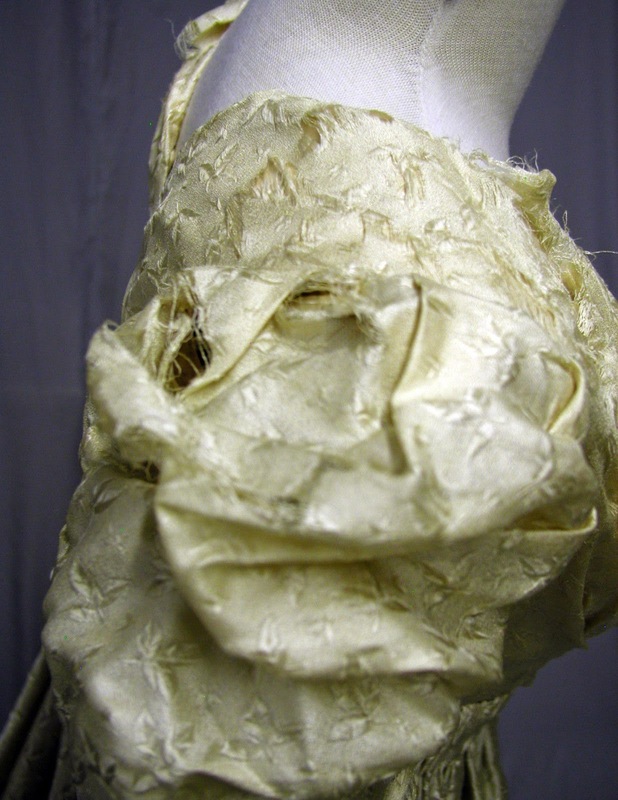 The way the seams are folded over are very late 19th/early 20th century. 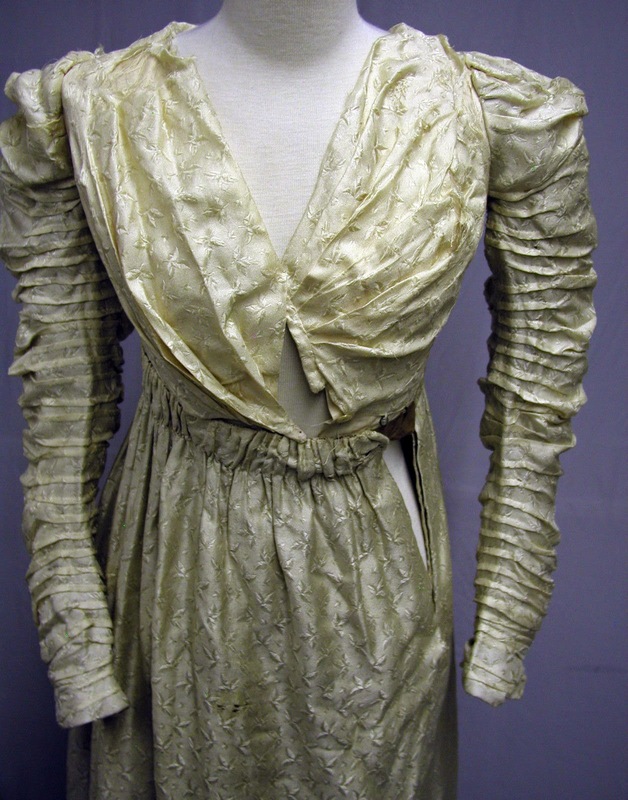 Although the seller acknowledges that the brown cotton was added later, I think it was actually added at the time the dress was made - late 1890's. Even the pintuck sleeves suggest the late 1890's. 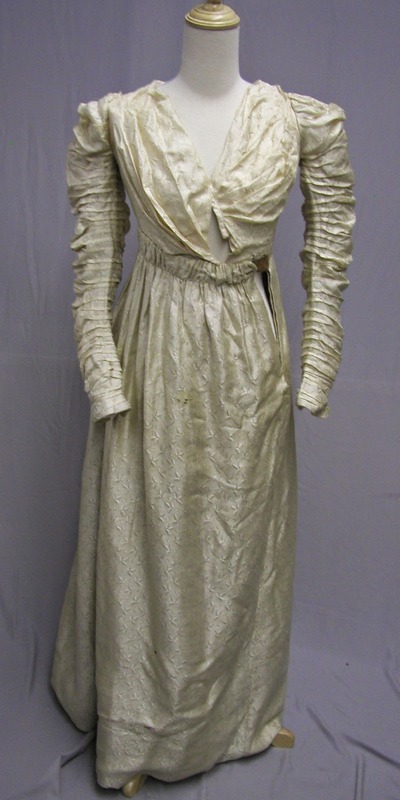 Although the fabric could be older - the style and type is fairly generic- I really wouldn't put this dress before 1898.